Presenting my first FO of 2013! My husband, Chase, has been after me for some time now, to knit him several items, including cowls, fingerless mitts, and hats, so after reviewing “his” yarn stash (yarn either picked out by him or claimed by him once it got into our home) last week, this cowl went to the top of the list. The yarn, Mirasol Sulka in the ever descriptive colourway “210”, came from the “Magic Bag of Doooom”, a bag of varying yarns and spinning fibres given to me my a friend, Jacqueline, last autumn while she was preparing to move. Her message said it was a bag that she’d leave on her porch for me and it turned out to be a massive trash bag that I could barely lug to the car and that barely fit in my trunk. Once I got it home and opened it, it was like a clown car…one fibre-y surprise after another. To this day, I still regret not documenting if for blog purposes. But I digress. I actually love how it turned out. The triangle peak in the front is great for V-necked coats, and the yarn is SO squooshy (a single ply blend of merino, alpaca and silk), it’s makes a very cozy FO, especially after having given it a bath in Soak for an hour or so. I did not love knitting with the yarn as it was somewhat splitty, but the FO was well worth it, and it’s not like it was weeks of torture or anything. Were There Changes Made To The Pattern? One less neck repeat, as it was looking very high and I was running short on yarn, plus since each repeat reduces the number of stitches, I was concerned about it fitting over his head. Chase is actually glad I shortened it. Did I Learn Anything New? No, but I think I got a better handle on short rows. Anything Else? The FO is WAY bigger than it looks in the pattern pics. Not in a bad way, I was just really surprised. Would I Make Another? : Absolutely! It was easy and fast, and as I too have a V-necked, pea-coat-style jacket, this would seriously come in handy. I might try it in some yummy worsted or aran weight yarn (like indigodragonfly MCS Worsted or something) to see if it will work. Since it uses a US10 needle, that just might do it. 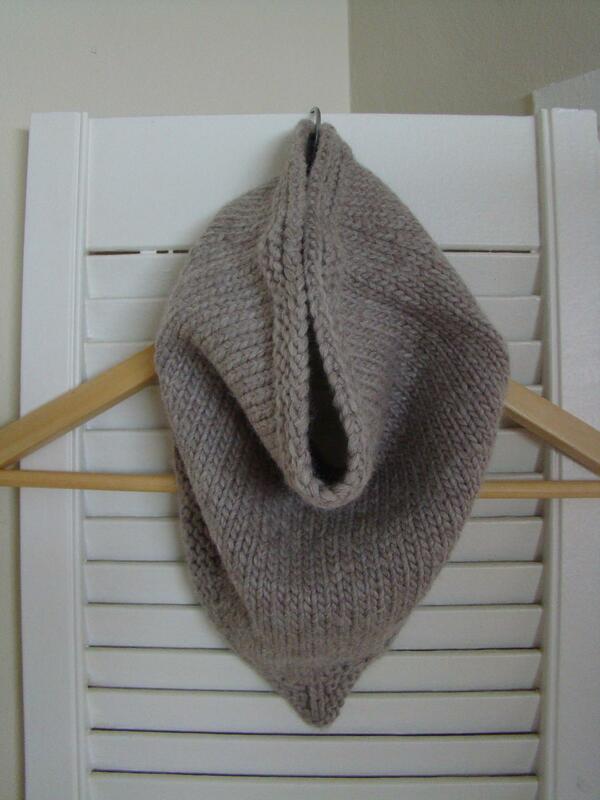 This entry was posted in Uncategorized and tagged cowl, fo2013 by Rayna. Bookmark the permalink.